Galley Wench Tales: Favorite Florida Anchorage? Manatee Pocket! Why is the relatively little-known Manatee Pocket our favorite Florida anchorage? It's cheap (free anchorage, albeit a bit on the shallow side). This time is our third stop at Manatee Pocket, also known as Port Salerno, Stuart and St. Lucie Inslet. Each visit, we appreciate the area that much more. on consignment at Nautical Pickers. A MackSails and rigger shop that replaced the very last piece of standing rigging that up until then we hadn't replaced. We'd held off as it held some ham radio bits, but we let the go when it broke on the way down from Jacksonville. Tim at MackSails also helped us find some 18/2 shielded wire for our new wind meter. Tim gave us a quote for new, US made MackSails for our Pearson 365 ketch. We wish we'd known sooner how affordable they were; we might've held off of other purchases, sold off our current sail quiver and replaced them with US-made MackSails. Hindsight! Two candy-apple-red used SCUBA tanks for mere $160 for the pair from the nearby Nautical Pickers Marine consignment shop on Dixie Highway. We remember fondly how friendly and informative the folks in the shop were last time in filling us in on all the cool local activities -- and we didn't even buy anything then. West Marine was in the area, and happily it's been recent enough that I put in a shift I'm still eligible for employee discounts. The little Mexican restaurant wedged between Green Apple Produce, my favorite product shop and the Mexican market makes killer tacos. We ate a full meal of shrimp and carne asada tacos for about $20 including tip. Its namesame -- Wayne swerved our dinghy after he saw a manatee's nostrils getting a snootful of air. All I saw was the concentric circles it left when it submerge. Dad and his wife Adrianne in Sarasota. Enterprise car rental picked us up and dropped us off near the dock at Pirates Cove for our car rental. This time we ran a Prius through its paces for six days of driving, ~$30/day. I drove somewhere around 600 miles on only ~13 gallons of gas! Once again, the Enterprise folks in Florida continue to offer exceptionally great service, though we've learned to plan for it to take a while for pick up, check out. and return. Stuart's a great origination point for visiting Mom in Delray Beach and Dad in Sarasota Florida. Great visits with both. Hard to believe it will likely be two years before seeing both my parents again. They are not happy about that. Nor am I, though cruising is rife with many difficult trade-offs, and for me this is definitely one of them. Wayne got a ton of boat work done, including setting up our wind meter, our new electronic chartplotter and resealing our hatches. We loaded up with fresh produce from Green Apple Produce. We caught a movie at Regal, this time it was The Hobbit, a good "big screen" choice. Part of the magic of cruising is to consider where in the world we could call home, once our wanderlust settles and a cruising budget runs dry. 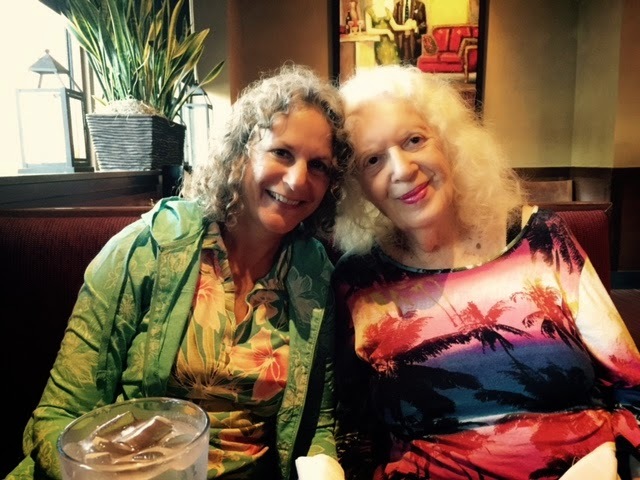 Mom & me near Delray Beach, FL. If I had to pick a place to live in Florida, Stuart appeals. It's far enough South to avoid most of the cold snaps that Jacksonville gets, offers lots of local entertainment, still carries a strong rural flavor and great produce, offers cultural diversity, seems safe, and affordable. Want to learn more about Manatee? Click here to read about our last Manatee Pocket visit, and click here for a comparison between Stuart and the more popular Vero Beach. Yeah, Manatee is a little bit of a backwater, but that's part of its charm, if you like that sort of thing. We do. So enjoy it if you're lucky enough to get the chance. Just don't tell too many others about, ok? December 17, 2014. UNITED STATES. We’re in Manatee Pocket, Stuart Florida (N26.59.098 W78.12.951) planning on setting sail tomorrow morning for Key West, FL. It's about 290 nm and will take us about three days, sailing 24/7. There will be no internet during our passage, but our US phones will be in range part or all of the passage. After Key West, onward to the South Pacific!